Wahama senior Jacob Warth (50) is fouled during a shot attempt in the first quarter of Tuesday night’s season-opening boys basketball contest against Wirt County at Gary Clark Court in Mason, W.Va.
MASON, W.Va. — On the wrong end of this tale of two halves. 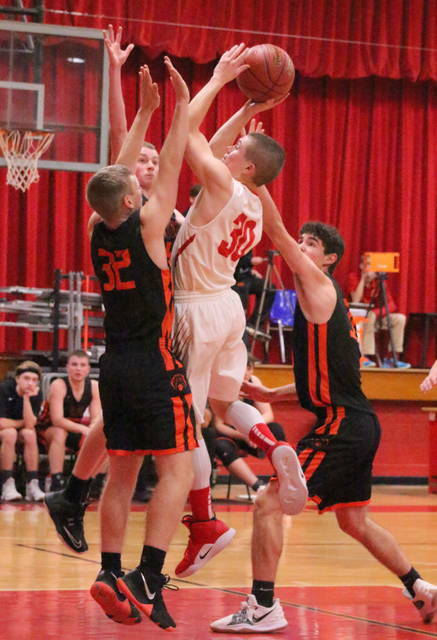 Wirt County nearly let a 15-point first half lead slip away, but the guests held the Wahama boys basketball scoreless over the final 2:47 of regulation en route to a 52-45 decision in a season-opening contest for both teams at Gary Clark Court in Mason County. The host White Falcons (0-1) showed some signs of life early on after jumping out to a 9-3 advantage, but the Tigers (1-0) rallied with a dozen consecutive points over the final 2:18 for a 15-9 first quarter advantage. The Red and White — who had four turnovers in each of the first two periods — cut the gap down to 17-12 following a Dakota Belcher basket at the 6:45 mark, but were ultimately never closer before halftime. WCHS — which did not commit a single turnover in the second canto — answered with a 14-4 surge over the next 3:46 while building its largest lead of the night at 31-16 with 2:59 left. Wahama closed the half with a small 3-2 spurt to enter intermission trailing 33-19. Both teams shot 33 percent from the field in the opening half, but Wirt County benefited from a dozen extra shot attempts. The guests were 11-of-33 overall — including 6-of-15 from 3-point range — and claimed a 9-2 edge on the offensive glass while committing five fewer turnovers. The White Falcons, conversely, were 7-of-21 from the floor in the first half, including a 2-of-10 effort from behind the arc. Wahama was also outrebounded 17-12 overall in the opening 16 minutes. The hosts missed all but one of their first seven shot attempts in the third stanza, but then hit 4-of-6 tries over the final 3:38 to close to within 38-31 following a Jacob Lloyd basket at the 1:06 mark. Seth Suslik, however, tacked on a basket with 13 seconds remaining, allowing the Tigers to take a 40-31 edge into the finale. Wirt County made a quick 5-3 run in the opening 90 seconds to push the lead back out to double digits at 45-34, but the White Falcons retaliated with eight consecutive points to close to within 45-42 at the 4:19 mark. Kyler Carper ended a three-plus minute scoring drought with a basket at the 3:01 mark, but a Brayden Davenport trifecta with 2:48 left allowed the hosts to whittle the deficit down to 47-45. 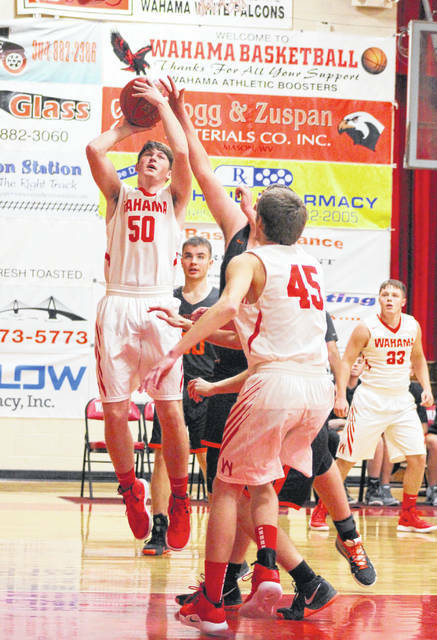 Wahama was never closer and missed its final field goal attempts, and the Tigers ended the final 1:15 of regulation with five unanswered points en route to wrapping up the seven-point outcome. 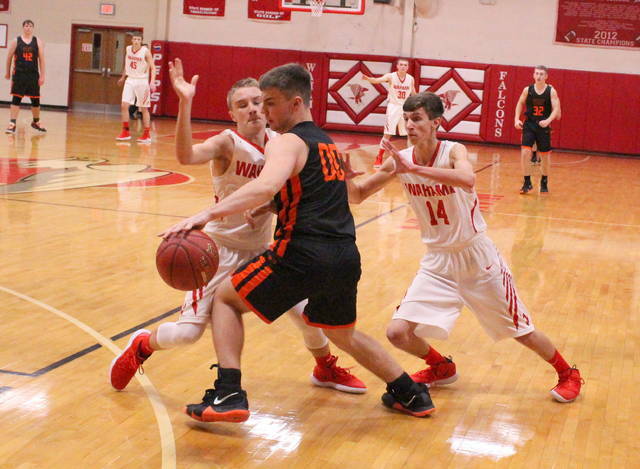 Wirt County committed a dozen turnovers in the second half — six in each period — and ended the game with three more giveaways than the Red and White. Wahama had only four miscues in the second half and a total of 12 turnovers in the setback. Afterwards, WHS coach Ron Bradley felt that his troops gave a much more spirited effort after halftime — but that performance was also somewhat discouraging after digging such an early hole. As Bradley noted, the White Falcons simply cannot afford to take a quarter or two off. Wirt County claimed a 37-26 advantage on the boards, including a 16-7 edge on the offensive glass. The guests were 12-of-24 at the free throw line for 50 percent, while Wahama netted 5-of-11 charity tosses for 45 percent. The White Falcons made 17-of-50 field goal attempts for 34 percent, including a 6-of-22 effort from behind the arc for 27 percent. Belcher paced WHS with 12 points and seven rebounds, followed by Lloyd with 10 points and Abrahm Pauley with eight markers. Davenport was next with six points and Jonathan Frye added four markers. Jacob Warth and Brady Bumgarner completed the scoring with a point apiece. Pauley also grabbed six rebounds, while Warth and Lloyd each hauled in four caroms. The Orange and Black netted 16-of-51 field goal attempts for 31 percent, including an 8-of-24 effort from 3-point territory for 33 percent. Suslik paced the guests with a game-high 19 points, followed by Carper and Justin Windland with eight points apiece. Carper also hauled in a game-high dozen rebounds for the victors. Wahama looks to rebound Friday night when it hosts Buffalo in a non-conference matchup at 7 p.m.